What Ghost did for pottery, Jon Favreau’s Chef did for grilled cheese sandwiches—both films used close-up framing and background music to fetishize an inanimate object in the sexiest possible manner. That scene in Chef illustrates the endless allure of the grilled cheese. It takes a simple sandwich brimming with childhood nostalgia and makes it adult-legitimate, a dish worthy of interpretation by professional chefs. Because the grilled-cheese formula is simply bread plus cheese plus butter, assuming you source quality ingredients, it’s technique that determines the success of the finished product. Should you preheat the skillet? How high should you set the flame? Cover with a lid or not? Slather butter or mayo on the outside of the bread? We reached out to knowledgable food writer friends, professional grilled cheese chefs, and our own staff for tips and tricks. Share your grilled cheese secrets in the comments. My tip assumes you can already construct a kickass grilled cheese sandwich. My secret is a level 202 add-on—bacon onion jam. I, for one, think there’s no greater flavor combination than cheese, bacon, and onions (especially on burgers). A light slather of bacon onion jam between slices of cheese adds incredible smokiness and caramelized sweetness to your sandwich. And it’s easier to make than you think. Here’s a video tutorial where I walk you through the process. Take two slices of whatever bread you like (for grilled cheese, I like mine on the hearty side). Generously butter one side of both. Throw an ample amount of butter in a roomy pan. Put the non-buttered side in the pan, and once crisp, flip to the pre-buttered side. Now place your thinly sliced aged sharp cheddar cheese on top of each slice while they’re still in the pan. 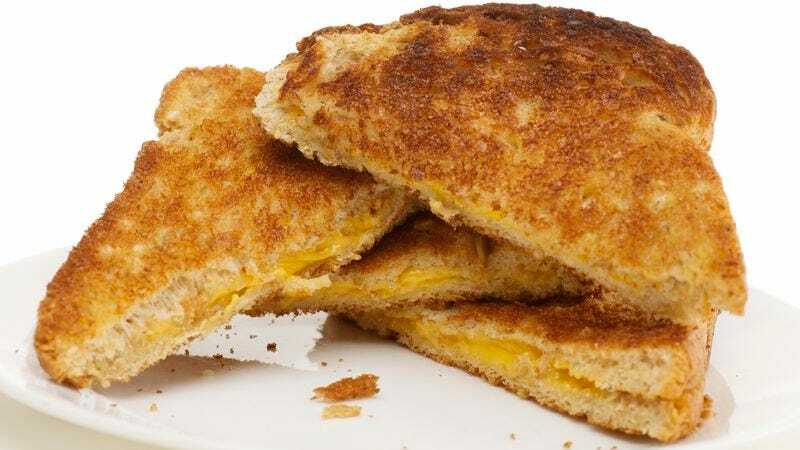 Buttering and frying all four sides of the bread makes for an extra rich and crunchy grilled cheese, and also helps the cheese to melt. If the cheese is thick, you can put a lid over the pan to steam it and help it melt. Just take it off in time for the bottom layer to crisp up again. A couple of years ago, portobello mushroom caps were 25 cents each at the local grocery store for about two weeks. I love mushrooms, so I bought a few dozen of them and then set about trying to figure out how to use a few dozen portobello mushrooms before they all got damp and weird. In that time, I stumbled across this recipe for fontina, arugula, and portobello grilled cheese sandwiches, and my life has never been the same. They’re crazy easy to make, and you can even toast up more than you’d need and enjoy them again the next day for lunch, provided you have some sort of toaster oven in your office for reheating. Seriously. Try them. They’re great. I’m going to assume everyone already knows that you damn well butter your bread in advance, letting it soak in before going anywhere near that pan, so I’ll head straight to the secret step. Besides the demonstrable fact that tomato slices are an improvement, the best step you can take is to slather some Grey Poupon on there—not on the inside of the bread, but rather in between the slices of cheese. That way, it doesn’t get infused into the toasted cheese container, but rather stays potent and sharp in its cheese-bonded swaddling. Great, now my mouth is watering. Grilled cheese sandwiches taste better over an open fire. They’re a perfect camping meal—easy to assemble and cook in a cast iron pan on a fire pit’s grill grate. What puts them over the top is a few thin apple slices, added after cooking to preserve their crunch. With its classic cheddar and tart apple combination, this sandwich is worlds better than a Cliff bar. My goal with grilled cheese is to have an even, brown, crunchy exterior with a soft interior. I don’t want a piece of toast. The key to even browning is a fairly low temperature. I like to joke that making grilled cheese is like making love—take your time with it for best results. With the traditional stove-top method, preheat your pan, and make sure it’s a low, even heat. The most common mistake is people turning the heat up too high, because you want the cheese inside to melt (without burning the outside). Covering the pan also traps the heat and helps the cheese melt faster. On ingredients, one trick to great grilled cheese is moisture control. You want as little moisture as you can in that sandwich. If you put wet vegetables in, like a slice of tomato, it’s even better if you roast the vegetable before hand. As vegetables heat, they’ll release all their moisture, and it’ll make a soggy grilled cheese. Then when I construct the sandwich, I like multiple cheeses, and I make sure the hardest cheeses are against the bread. And make sure to keep the sandwich symmetrical—you want bread-cheese-filling-cheese-bread. If you just put the toppings on top, you won’t have the melted cheese to trap the fillings and stick to the bread. It’s very important to butter the bread and not the pan. Because I want that crispy, crunchy outside, the best thing to use is room-temperature-softened butter, not melted butter. If it’s already melted in the pan, it’ll soak through the bread instead of crisping it. Lastly, compound butter is the easiest thing in the world and makes everything fancy instantly. We make rosemary butter, chipotle powder butter—it could be just some garlic granules mixed in with the butter. Spread that on the outside of the sandwich, and you get a huge punch of flavor. It’s the first flavor your mouth encounters. My favorite, exceedingly simple inclusion to a grilled cheese is adding a handful of alfalfa sprouts before cooking, daikon sprouts if you want some kick. Like the previous suggestions of apple and mustard, it’s a great way to add a contrasting sharpness to the base flavor of cheese and bread. But sprouts give a great textural dimension as well, forming a latticework that threads through the sandwich like rebar in concrete. Hmm, I seem to be at a loss for providing a tantalizing analogy, but I swear to god, they’re delicious. As a Texan, I guess it’s my duty to stump for the use of Texas Toast—the bread that’s sliced thick as my state’s air of self-satisfaction, and the best possible choice for making a grilled cheese sandwich. Disregarding any additional ingredients my colleagues may be suggesting here as a means of making what is more accurately called a “panini,” the grilled cheese sandwich really comes down to just cheese and bread. You want that other 50 percent to be just as richly satisfying as the other half, so get yourself some thick Texas Toast and slather it in butter with a little touch of garlic. Sure, it doubles the caloric count, but you’re eating a goddamned wad of melted cheese. Do it right. I agree that 50 percent of the success of a grilled cheese comes down to the bread, but Texas Toast is not a part of that winning combination. Big, bulky, and overpowering, it butts into a grilled cheese like a portly and overbearing uncle taking too much space at a family festivity. This is why I recommend using English Muffin Toasting Bread. The lighter and absolutely delicious bread lends itself well to a perfectly grilled state and complements a good cheese in a more refined way, leaving you satisfied instead of overstuffed. The most important thing to do when you think about improving a grilled cheese sandwich is to stop yourself. Sure, kimchi makes everything delicious, as does miso, as do pickled hot peppers. If you want mozzarella en carozza, make that. But if what you want is a grilled cheese, let yourself have that. Get white bread that looks like an emoji. If you have access to a Japanese bakery, avail yourself of its offerings. For me a grilled cheese is made with American cheese; Land O’Lakes sharp American is my favorite. Cook it on a cast iron to make yourself feel rugged and connected to the Earth. Use enough butter that your arteries reflexively quiver. You could paint the exterior with mayonnaise before cooking it, but I’m not from the part of the country where that is done, so I don’t. Eat it too hot. Find a can of soup. Save your “inspirations” for less perfect, elemental foods. At this point in our culinary history, avocado has been added to so many dishes that it seems a rather uninspired choice to combine with a grilled cheese. But long before every idiot chef—amateur and otherwise—decided to just throw some avocado into their dishes, I was slipping a few slices in between toasted cheese and bread. You might be thinking that the avocado would yield too quickly to the heat of the pan; that’s entirely possible, which is why I wait until I’m ready to bring the cheddar-covered sides together before adding it. It’s not just more colorful this way—the cool avocado is a tasty counterpoint to the cheesy goodness. I’m a firm believer that there are few savories that can’t be improved with a pinch of garlic salt. That includes grilled cheese; drop just a bit into your butter wash. Soak it into the bread, and welcome yourself to a better tier of cheesy indulgence. Just be careful: A little goes a long way, and you don’t want to have to explain to your friends and loved ones that you’re a garlic monster now, just because you wanted your lunch to have a little extra kick. I’ll suppress my urge to whip out some fancy-pants grilled cheese recipe that diverges too far from the classic configuration and instead go with something that’s only slightly off-brand: jalapeño-popper grilled cheese. (Full disclosure: This is a recipe from my girlfriend, and she used it to handily trump my crab-rangoon grilled cheese in a one-on-one sandwich battle.) If you’re going for quick and dirty, it’s as easy as spreading cream cheese between your processed cheese slices and throwing some pickled jalapeño bits in there for a sandwich with creaminess, heat, and a bit of vinegary bite. For the deluxe version, upgrade to sharp cheddar and/or pepper jack and roast some fresh jalapeños in the oven before adding them to the mix.